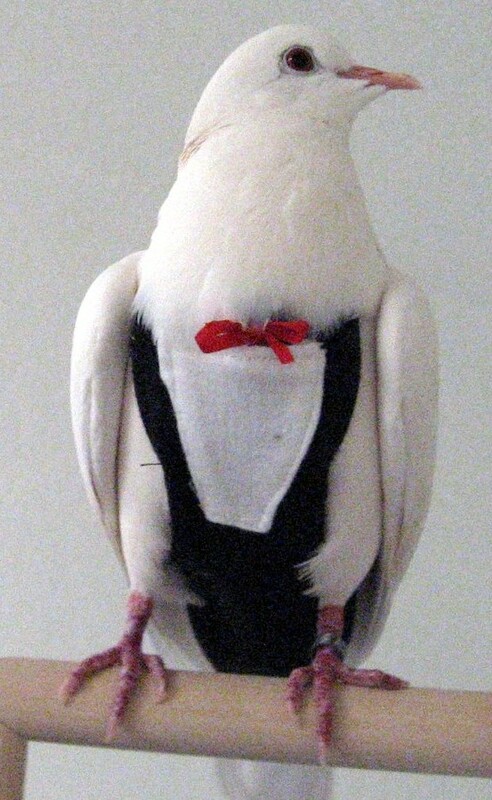 Cloud, my 5-year-old male Ringneck Dove, has been working as a registered therapy animal since October of 2010. He is a popular visitor to a senior day care in Mission Viejo, and he is also certified as a “Reading Education Assistance Dog” (or “Dove”, in his case). 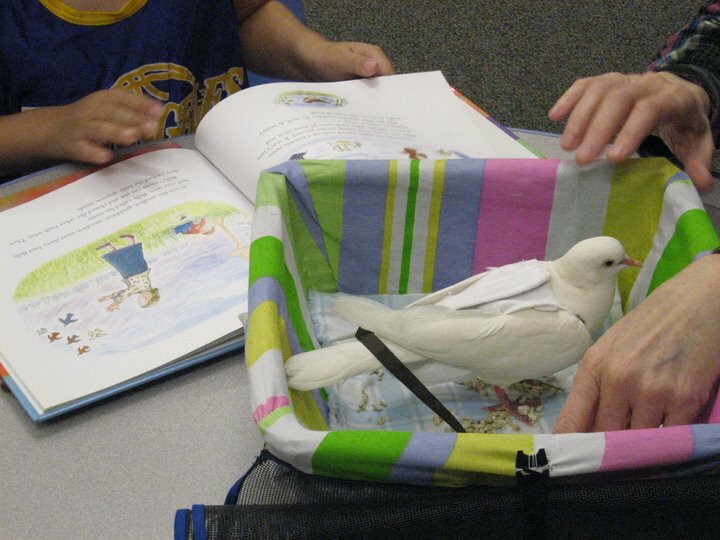 In his role as a “Reading Dove”, he visits children in an elementary school classroom on a regular basis, and the children read aloud to him. 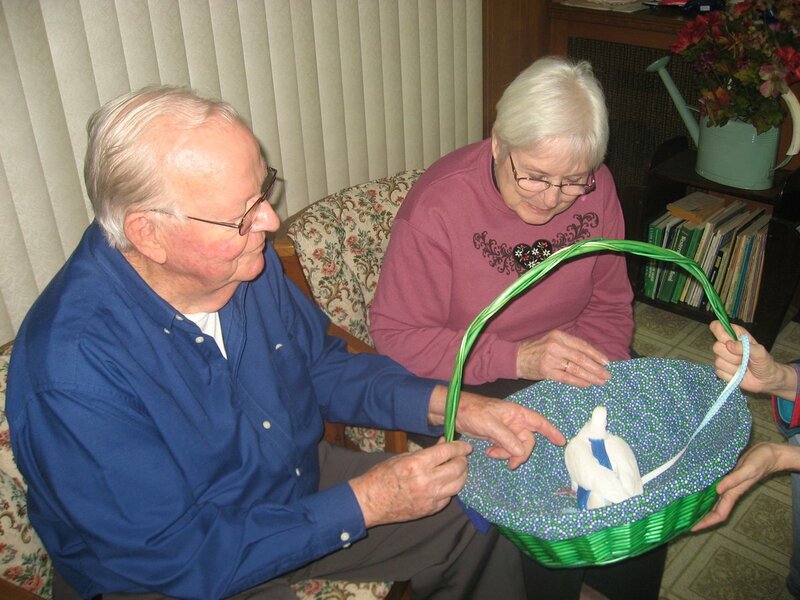 At the senior day care, Cloud is placed in an open basket, and he is carried from person to person. 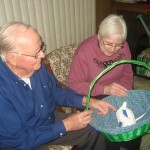 The seniors are encouraged to reach into the basket and pet him and talk about him. Many of the seniors have owned birds before, but smaller birds (canaries, parakeets) are not as docile and don’t permit handling. Cloud’s gentle demeanor and quiet cooing make them smile. Many of the children Cloud visits have never had a pet. Their first question is always, “Does he bite?” I encourage them to pet him and see that he is very tame and friendly, and soon the students are feeding him seeds or shredded lettuce, and giggling at his attempts to pick up the treats from their palms. 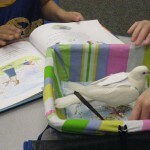 Cloud also participates in elementary school presentations about therapy animals. Cloud is registered with AHF Caring Creatures. Although a variety of animals can be registered, including cats, rabbits, birds, mini horses and llamas, most of the therapy animals in the group are dogs. Our senior and school visits are done in a group, with several therapy dogs and Cloud. Many of our dogs are of hunting breeds, so we have to be careful to keep Cloud at a distance. The dogs are too well trained to attack him, but if they are distracted, they cannot do their job properly. Because he is so quiet, the dogs are often not even aware he is in the room with them. Cloud even worked at AHF’s booth at a pet fair, at the same time as a cat and two dogs. None of the other animals even knew he was there, because he didn’t flutter around and make noise. 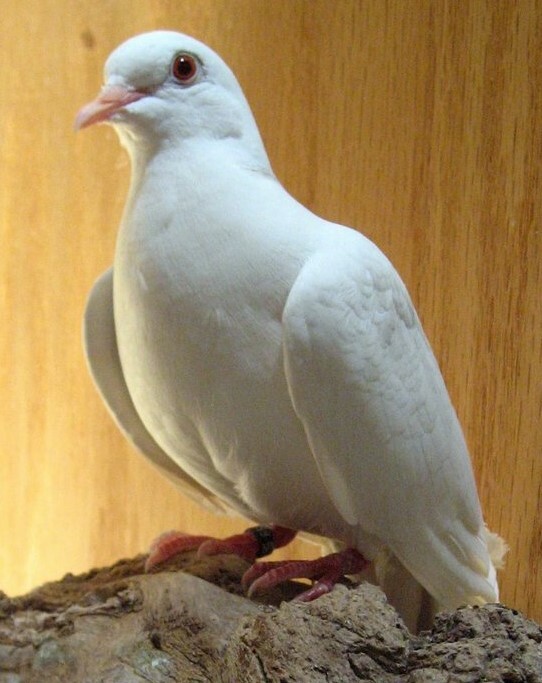 Their quiet demeanor and positive associations make doves ideal therapy animals. Grapes and raisins are still killing dogs, and lilies are still killing cats. Chocolate, xylitol, prescription drugs and other items can be life-threatening, and life-saving treatment can rack up hundreds or thousands of dollars in veterinarian bills. None of this is new information, but many people still don’t know that our houses and yards are full of things that can sicken or kill pets. Only 34 percent of pet owners know that cocoa mulch is toxic, according to a survey conducted by Petplan insurance. Only 16 percent know that tulip bulbs are dangerous, and that’s a new one for me. A total of 67 percent knew the dangers of grapes, xylitol in sugar-free candy and gum, diced onions and coffee grounds. Medications intended for humans topped the 2013 list of reasons people called the Animal Poison Control Center of The American Society for the Prevention of Cruelty to Animals. The telephone hotline handled 180,000 calls, and nearly 20 percent were for prescriptions, including 4,151 calls about pills intended to control blood pressure or heart rate and 2,836 cases involving pain killers. 2. Insecticides, 15.7 percent of calls. 3. Over-the-counter drugs including acetaminophen and ibuprofen, 14.7 percent. 4. Household items including expandable glues and paints, 9.3 percent. 5. Food for humans, including onions, garlic, grapes, raisins and xylitol. 6. Meds prescribed by veterinarians. Some are available in chewable form with nice flavors, and pets have been known to break through pill bottles to eat the whole batch. 7. Chocolate, the darker the chocolate, the higher the toxicity, 7.7 percent. 9. Plants, mostly houseplants eaten by cats, 5.4 percent. 10. Lawn and garden products, 2.8 percent. Here are the symptoms that indicate you need to get to a veterinarian quickly: vomiting, diarrhea, drooling, loss of appetite, tremors, seizures, excessive thirst and infrequent urination. Human and pet meds can cause stomach ulcers and kidney failure, especially in cats, according to veterinarian Jules Benson at Petplan. Internal bleeding, pancreatitis and kidney failure can all be caused by things that are toxic to pets. The number for the ASPCA’s 24-hour poison hotline is (888) 426-4435. Have your credit card handy because the call will cost you $65. There’s no charge for calls to national Poison Control Center hotline at 1-800-222-1222. They handle calls for people and for pets, but if they feel they can’t help they refer callers to the ASPCA Animal Poison Control Center. Go to aspca.org/apcc for further information.